Furazabol was originally manufactured in Japan in tabs of 1 mg strength. Dan Duchaine was very unimpressed with this drug, noting that he rarely saw any very large Japanese bodybuilders. I'm inclined to agree, but let's take a look at it, since it has become quite popular ever since its reappearance on many underground labs' price lists. Finding out information on this stuff was agonizing, since most of it is in Japanese, and no athletes really use it. Anyway, with respect to its half-life and active life (and detection time), I'm pretty much estimating from what I've seen in studies. One study said that the half-lives of unchanged Furazabol in two human subjects were 1.87 and 1.29 h respectively, and the recovered amount in 48 h was averaged to 24% (33% for one, 15% for the other, respectively) (4). Unfortunately for tested athletes, Furazabol is metabolized in the body into 16-hydroxyfurazabol and then excreted in urine. The presence of this compound in urine can be monitored with a very simple, standard procedure (4) for urine screening, and this is incorporated into the general dope testing protocol for anabolic steroids employed by the IOC and other such no-fun-agencies. 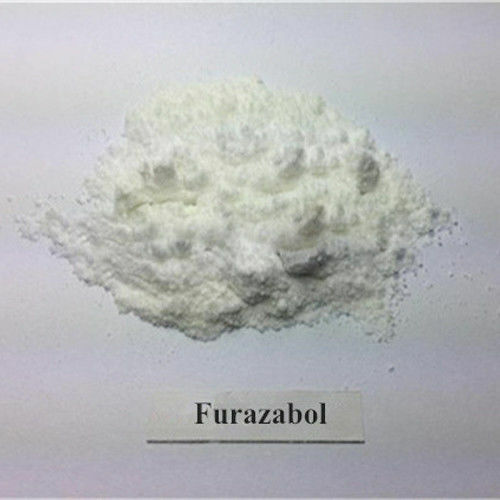 Furazabol (Miotolan) is a 17-alpha-alkylated oral steroid that is derived from dihydrotestosterone (DHT),it is a derivative of the anabolic steroid stanozolol. It differs from stanozolol by having a furazan ring system in place of the pyrazole. It has a c-17alpha methyl group, which allows it to be taken orally and causes hepatotoxicity in some individuals.Furazabol does not aromatize and also has very minimal bloat, that is why there is little to no water retention when administering the drug, and muscle begins to appear much denser and harder,therefore it should produce a lean and vascular appearance. Interestingly, it also has no 3-keto group, which is needed for androgenic binding . This obviously hinders the androgenic activity of the compound and thus limits its muscle and strength building abilities. Due to its androgenic effects and lack of estrogenic activity, bodybuilders with relatively low body fat should notice a muscle hardening effect when using adequate dosages.Its moderately potent androgenic activity, give it a fairly low risk for gyno or negative effects on the libido. These are traits shared by Stanozolol. It is for this reason that Furazabol is most commonly compared to Stanozolol in both their structures and effects. Noticeable gains in lean muscle mass and strength are likely not going to be achieved unless doses of at least 200mg/day are used. Big increases in weight are not likely to happen with this steroid either, so increased blood pressure and painful back pumps should not be a problem. 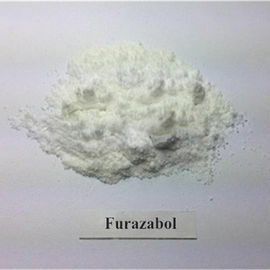 If used for the specific purpose of enhancing the appearance of the user muscle, Furazabol can be quite beneficial when used in conjunction with other anabolic compounds. Furazabol can not aromatize and therefore estrogenic side effects are not a concern with this compound. As well, the drug is relatively mild in terms of expected androgenic side effects and therefore these should not be a source of concern for most users. This is also a reason why Furazabol is a relatively safe choice for women. The only real cause of concern for most users would be that the compound is derived from dihydrotestosterone as it relates to (1,4). This of course will indicate that side effects associated with dihydrotestosterone could become apparent with use of the drug. Hair loss, acne and prostate enlargement are all possible side effects that could be encountered when administering the compound. Finasteride will usually help in preventing or minimizing the effects of dihydrotestosterone, but it will not help with this as a result of furazabol. This is due to the fact that as stated the drug is derived from dihydrotestosterone and so its androgenic activity will not be increased via interaction with the 5 alpha reductase enzyme. However these related side effects should be tolerable if dosages and cycle length are kept within reasonable limits. As noted earlier, since the compound is 17-alpha-alkylated liver values will likely be raised when administering it. For this reason, and the fact that permanent liver damage is possible, it is recommended that a user limit their use of the drug to about 4-8 weeks. This moderate length of use should not result in any serious complications in terms of liver health. In terms of dosing, for inexperienced males users, doses in the range of 30-90 milligrams per day should be sufficient to promote very noticeable gains. Due to the short active life of the compound, multiple doses a day should be administered. Three to four would likely be the minimum needed to provide the users with stable blood concentrations of the drug. In terms of the appropriate dosage for use by women, 5 to 20 milligrams per day should be adequate to experience gains in muscle mass and density. As always however, doses larger than those recommended here have been experimented with by both males and females. Of course with these increasing doses come greater risks and likelihood undesirable side effects will be experienced. While there have been some studies conducted that have indicated that Furazabol has little effect on endogenous testosterone production, for the most part these studies used relatively small doses , much smaller than would be needed to experience any type of muscle building effect. For this reason, along with the fact that it is unlikely that any male users would administer Furazabol without running any other type of anabolic steroid(s) in conjunction with it, the regular post-cycle recovery protocol should be followed.